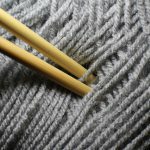 Here are some free knitting patterns. Summer tops are what it’s about today. I recently finished this one for myself. It took me roughly two months to knit, so it was quick and easy. When I say two months, I would say that on average I knitted for about a half hour a day over the course of two months. This knitting pattern will fit anyone from a size 10 to a size 16. The length of the finished top is 60cm, but feel free to make it longer if you prefer. The length of the sleeve is 15cm. For this first one of free knitting patterns summer tops, you will need to do the dropped stitch pattern. You can see some more detail on how to do this stitch at the bottom of this post. Using MC cast on 82 sts. 2nd Row: P to end dropping the extra loops. 3rd, 4th, 5th and 6th Rows: MC k to end. 7th Row: CC k1 *5W, 5k* repeat from * to * to last st, k1. 8th Row: As per 2nd Row. 9th, 10th, 11th and 12th Rows: MC k to end. Repeat pattern from 1st to 12th row until back measures about 55cm ending with 6th or 12th row of pattern. K pattern for 36 stitches. Turn and leave rem sts on a spare needle. Working on these sts only, cast off 5 sts, pattern to end. Next Row: Cast off 4 sts, pattern to end. Continue in pattern until back measures 60cm from cast on edge ending with 6h of 12th row of pattern. Cast off. With RS facing return to sts left onto a spare needle. Transfer 10sts onto a safety pin. 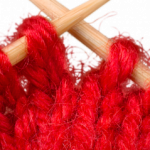 Rejoin the matching yarn and complete the second part to match the first. Work as given for the back until the work measures 50cm from cast on edge ending with 6th of 12th row of pattern. Work neck shaping as given for the back. With MC cast on 72 sts and k6 rows, then work in pattern as given for back until sleeve measures 15cm from the cast on edge ending with 6th or 12th row of pattern. Cast off. Join the right shoulder seam. With RS facing and MC pick up and k 27sts down the left side of the front neck. k sts from safety pin. Pick up 27sts up to the shoulder line. Pick up 20sts down the right side of the bak. K 10 center sts and pick up 20sts up the left side of back neck. k6 rows. Fold sleeve in half and place fold to shoulder seam. Sew sleeve to front and back. Join side and sleeve seam. It’s warm weather at last, and time to add some hand-made style to your summer wardrobe. Our collection of 18 up-to-the-minute tees, pullovers, cardis and tops are just what you need to pair with trousers, shorts and skirts. Most are easy stockinette and seed stitch, featuring stripes and solids, with a few for lace lovers as well. All experience levels; many sized up to 3X. This is a great little paper back which is going for about $12 at the time of writing this post. Click on the link above or the pic to find out how you can get your copy. This summer top is great for breezy summer days. 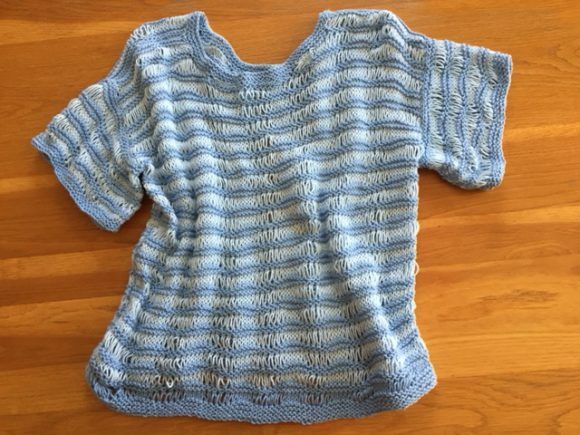 I haven’t started knitting this summer top yet, so don’t have a photograph, but it is a tighter fitting version than the previous one and in a more solid type attractive pattern. This summer top has cap sleeves and a round neckline. This one will fit a chest of 92cm. The finished length is 56cm. If you can’t get the same wool, the tension for this size is 32sts x 42 rows = 10cm – stocking stitch using 3 mm needles. This pattern was written by Margaret Botha. Row 1: *P2, tw2, p2, k2b* rep to last 6 sts, p2, tw2, p2. Row 2: *K2, P2* rep to last 2 sts, k2. Row 3: *P2, k2b, p2, tw2b* rep to last 6 sts, p2, k2b, p2. Row 4: As per 2nd row. Rows 1 – 4: *K3, p3* rep to end of row. Rows 5 – 8: *P3, k3* rep to end of row. Row 2: *P1, k5, p5* rep to last 4 sts, k4. Row 3: K3 *p5, k5* rep to last 7 sts, p5, k2. Row 4: P3 *k5, p5* rep to last 7 sts, k5, p2. Continue in this way, working each set of 5sts once st to the RH side of the work. Do not pull the yarn too tight. Slip sts onto thinner ndls. Both points pointing in the same directions. With RS together; using 3mm needles, ktog 1st sts from both ndles tog 2x. Pass 2nd st on RH ndl over 1st st.
Rep process until all sts have been cast off. Using 3mm needles, cast on 158 sts. Please note that sts have to be decreased or increased in the first gs row between pattern changes. Beg with pattern no 1 and repeat 12 times altogether. Work 2 rows of gs for pattern 2, decreasing 2 sts (156 sts). Rep pattern 2, 6 times altogether and rows 1-6 once more. Work 2 rows gs. Inc 4 sts for pattern 3 (160sts). When work measures 35 cm, cast off 15 sts at beg of next 2 rows for armholes. Continue without shaping until armhole measures 11 cm. Work 2 rows gs. Dec 4 sts across 1st row (126) sts. Change to pattern no 2. When armhole measures 19.5 cm leave sts on a st holder. Work as for back until armhole shaping measures 10 cm. Work 44 sts. Slip next 38 sts onto a st holder for neck. Work 2 rows on remaining 44 sts. Neck shaping is now worked on alt rows. 1st dec: Dec 3 sts at neck edge. 2nd dec: Dec 3 sts at neck edge. 3rd dec: Dec 2 sts at neck edge. 4th dec: Dec 1 st 2 times. 34 sts remaining. Leave these sts on a holder for the shoulder. Join yarn at neck edge for left shoulder. With WSF, work 2 rows. Shape as for right side of the neck. Slip front shoulder sts onto one ndl. Slip the last 34 sts of back onto 2nd ndl. Make sure the RS are facing each other. Cast off these sts using 3 ndl cast off method. With RSF, pick up 37 sts down left front, 38 sts from front neck, 37 sts up right front and 58 sts across back neck. Work 4 rows in gs. Continue in pattern no. 2. Inc in 3rd then every 4th row to 122 sts. Work until work measures 16cm. Cast off in patt. Join left shoulder in the same way as the right. Sew up neck border Set in sleeves and then join all seams. 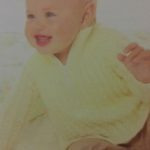 There you have it 2 free knitting patterns summer tops for you to try. My advice to you is to try the first pattern before you attempt the second, as it is the far easier choice. Next Post Cow Knitting Pattern – The Kid In You Will Love This One!